Copyright @ 2000-2012, Lynn Conway. 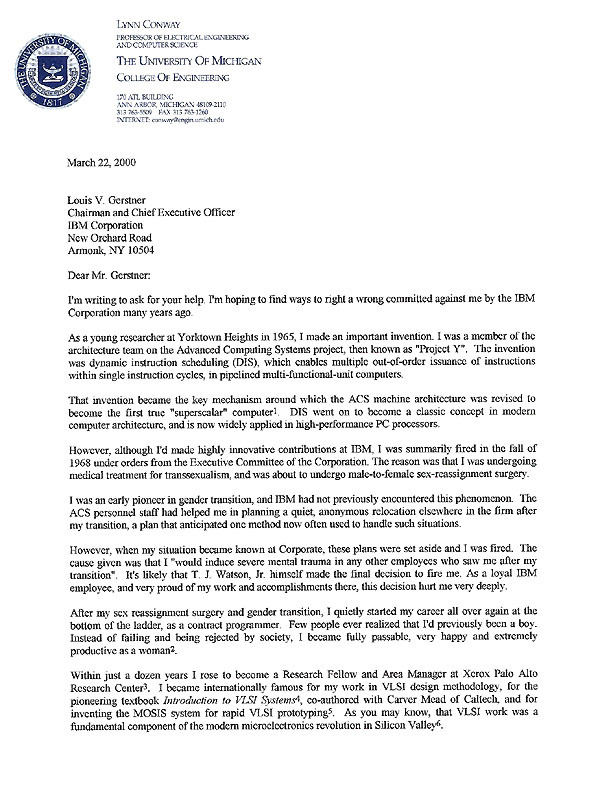 In March of 2000, I wrote a letter to Louis V. Gerstner, then President and CEO of the IBM Corporation, describing the events surrounding my firing by IBM in 1968. 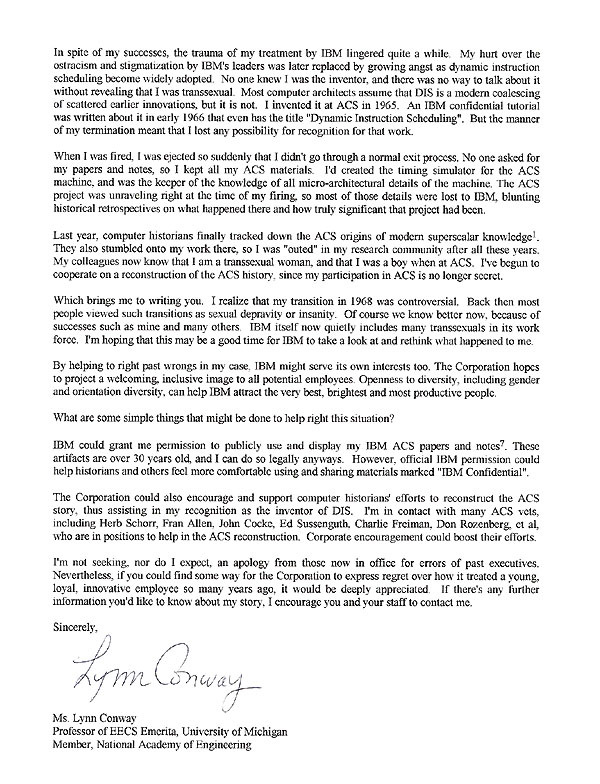 My objectives in writing the letter were to (i) obtain formal clearance from IBM to distribute my IBM-ACS archives, (ii) encourage IBM to support the further release of ACS documentation and the reconstruction of ACS project history, and especially (iii) obtain an expression of regrets about how the IBM of the past had treated a loyal and productive employee just because that employee was undergoing a gender transition. The first item was kind of a "giveaway", since I had excellent legal advice that the 32+ year old documents could be distributed anyway. Clearance would simply ease concerns anyone might have regarding distribution. I figured that IBM could do this easily and without any risk. I figured the second item would also be easy for IBM to do and was in their self-interest too. After all, IBM's engineering staff hadn't realized up until Prof. Mark Smotherman's historical investigations and the posting of my ACS archives that the ACS-1 had actually been the first superscalar. Further reconstruction of the project's history would undoubtedly reveal even more about the ACS's contributions to computer architecture and engineering. However, the third point was obviously a very different matter. I felt that IBM needed to openly admit how terribly they had treated me years ago. I wasn't seeking damages, or threatening a lawsuit. How could I, for the events had occurred over 30 years ago? I instead merely sought an 'expression of regrets', so as to get some closure. I held my breath wondering how they would respond. This letter was personally conveyed to Lou Gerstner by a nationally-prominent colleague of mine who happened to be on IBM's Board of Directors - and who therefore knew Lou Gerstner personally. I sought my colleague's support in relaying the letter so that he could assure Mr. Gerstner that Lynn Conway was a real and serious person and that the letter was a sincere one. I had sent the letter to my colleague in late March, and the letter was finally conveyed to Mr. Gerstner on June 23, 2000. My colleague attended an important event with Mr. Gerstner just a few days later, and my letter immediately the subject of an animated discussion. My colleague later reported that Mr. Gerstner "was appalled that the company would have acted in this manner" ‒ and on hearing his report I became optimistic that some kind of "expression of regrets" might be forthcoming. The following week I received a phone call from Lauren C. Bruzzone, Assistant Counsel - Research, with regard to "the archives and potential intellectual property". I sent a copy of my archives to Ms. Bruzzone in early July, again indicating an interest in clearance for historical and academic purposes, and in follow-up regarding the other two points in my letter. The 8-22-00 call involved me and Dan O'Donnell and an attorney present in Dan's office. Mr. O'Donnell referred to me as "Prof. Conway". I called him "Dan". O'Donnell referred to my original letter, and to some initial confusion about the dates - since it was dated March 22, but relayed to Lou Gerstner much later, Lou had originally wondered if it had gotten stalled within IBM. We sorted that all out as a non-problem. 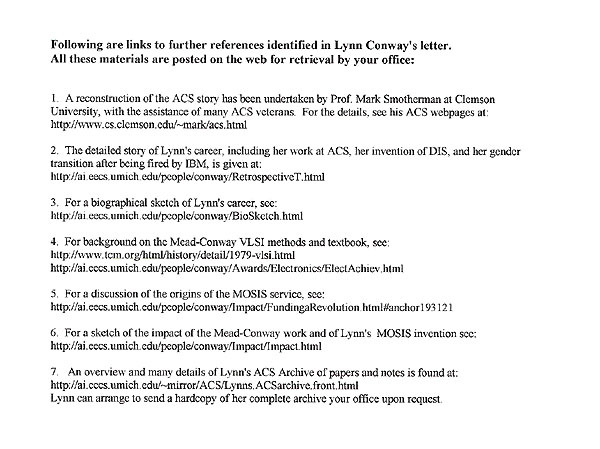 O'Donnell said "IBM would grant me a worldwide license to distribute my ACS archives for scholarly purposes as long as the disclaimer was included indicating that the documents had been declassified by IBM - - ". I thanked him for that. O'Donnell said that IBM was going to support an internal effort to document and reconstruct the ACS project, and that it would be led by Ed Sussenguth. I immediately said that such an effort was unlikely to be seen as a serious scholarly effort by outsiders, and that it would be ever so much more useful to support outside groups like CBI and TCHM to do that. Dan showed strong signals of resistance to my reaction - indeed, a certain stiffness - he clearly didn't like my immediate, assertive suggestion that their plan was not a good one. I guess he wasn't used to having people question his decisions. This was the most important part of our interaction and the only truly serious issue to be covered. O'Donnell said that "IBM had agonized over this one - - ". [I wondered what he meant by that (and I still wonder)]. "The IBM he'd always known was a wonderful company that always treated people very fairly - - ". [Hmm. This sounded like he thought that IBM hadn't fired me. Or perhaps he thought that I was fired "fairly"]. I asked him: "Do you mean that you doubt that they fired me?" O'Donnell said, "no - it's just that we don't have any records that that happened". I said "well, I have very detailed records, and there are plenty of witnesses to what happened - that can all easily be confirmed - so do you really doubt that it happened the way I said it did?" "is to put this all behind us and just go forward from here - - "
I thought: Best for who? Sure, it's best for IBM - they don't take any responsibility for anything that way. But what about me? They're saying, hey, what's past is past - let's forget about it and move on. Sure, THEY'd like to forget about it, just like all criminals would like to forget about their crimes. But I can't forget about it! Especially now that they're brushing me off this way! So, I said something like "well of course YOU'D like to move forward, and put it behind - - "
the ACS history - at least that way the full accomplishments of the team might be recognized in the long term - let's be sure to do that". He did not reply to that,and the conversation was over. My reaction to this conversation was one of stunned bewilderment and disappointment. I had informed the IBM Corporation of something grievous they had done years ago, something witnessed by many now-prominent people, something that had tragic consequences in my life and had almost ended my chances for a life. And all I'd asked for was a simple 'expression of regrets'. I'd hoped for an expression of regrets not just to ease my own mind and help heal old wounds, but also to help symbolize that times had changed, and that IBM now recognizes that gender transition is no longer a "termination offense" as it was in the IBM of old. In a very real way, I'd handed IBM a perfect hand to play" for correcting past wrongs and doing some healing. It would have been so easy. But they couldn't bring themselves to do it; to make a simple expression of regrets. In July 2000 I'd begun to work with Mike Hiltzig of the L. A. Times on backgrounding regarding my story, for possible use in a news article, magazine profile or perhaps a later book. I'd hoped that my interactions with IBM would yield something really neat for the story - about how IBM had changed since the old days - how they'd expressed regrets over what they'd done to me years ago. The timing was perfect for including news of a "recent expression of regrets" in the L. A. Times story, Through the Gender Labyrinth, when it came out in November, 2000. Unfortunately, the story went to press without any good word from IBM. I'd given IBM a great hand to play, but they "didn't get it" and threw the opportunity away. Worse yet (as I learned later), when my colleague on IBM's Board of Directors checked with IBM senior executives to see how things turned out, he was told that "everything worked out just fine - we decided to put that all behind us and just go forward". Of course IBM didn't say that the "we" meant "just IBM"! Instead they slyly left my colleague with the misimpression that the "we" included Lynn, perhaps thinking that he'd never compare notes with me. So be it. It's all just part of the story now. IBM and O'Donnell will have to live with the role they played in this still-unfolding story. Can large institutions "express regrets" for past wrongdoing? Can large institutions "express regrets" for past wrongdoing? You bet they can! Some institution have "souls" and really do care about taking responsibility for past errors. CAMBRIDGE - What began as an inquiry into a student's suicide in 1920 ended in Harvard University convening a secret tribunal that labeled 14 men "guilty" of being homosexual, and forcing the students among them to leave not only the school, but the city of Cambridge. The hidden history of the body known only as "The Court," first reported by the Harvard Crimson student newspaper, describes Harvard's desperate efforts, which were kept secret for more than eight decades, to hide from public view a secret gay subculture on campus. Listen to the Harvard President's words again: "I want to express our deep regret for the way this situation was handled, as well as the anguish the students and their families must have experienced eight decades ago." Those words are not aimed so much at the ones who were victimized (and who have now passed on). They are instead aimed at Harvard University itself, aimed inward into the very soul of the institution, asking it to take full responsibility for and comes to grips with its past actions. Do you think that the current-day IBM fully understands what the company did to Lynn Conway in the 1960's? Do they understand how awfully close IBM came to destroying her life by suddenly firing her at a critical point in her transition? Do they even remotely care? Evidently they do not. Otherwise, someone in the Executive Committee in IBM would have reasoned that maybe they should have "expressed regrets", thus sending a better message out into the company about the need to take responsibility for and learn from past corporate actions. What makes this all the worse is that IBM is right now patting itself on its back for revising its EO policy to include "gender identity" ‒ claiming that it welcomes transgender people in its work force. The hypocrisy of such self-congratulations, shortly following the time when IBM's senior executives couldn't bring themselves to "express regrets" about IBM's past firing of Lynn Conway, should be obvious. Does IBM have a "soul" like Harvard University does? Will IBM ever be able to admit to itself that it treated transsexual people outrageously in the past? Will they ever comprehend and regret the awful things they did to Lynn? Will a later generation of IBM executives ever figure this out and do the right thing?